Chinese Puzzle is the long awaited follow up to Cedric Klapisch's The Spanish Apartment (2002) and Russian Dolls (2005). 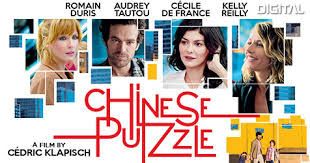 While fans of the previous two movies will be absolutely delighted with this third instalment, seeing the first two films is by no means a pre-requisite for Chinese Puzzle. It is a sweet, quirky and fun film which works very well as a stand alone film. The film may make a tad more sense with the knowledge of the past films, but it is knowledge that you would be oblivious to needing otherwise. At 40 years old, Xavier Rousseau (Romain Duris) has found himself incapable of getting from point A to point B without difficulty. When his ex-wife, Wendy (Kelly Reilly) moves from Paris to New York to be with her new American boyfriend, Xavier follows as he is unable to be without their two children. What awaits him in New York is more complicated. He moves in with his best friend, Isabelle (Cecile De France) who is a lesbian and carrying his child, gets married to Nancy (Li Jun Li) in order to stay in the country and is then visited by Martine (Audrey Tautou), who makes life even more complicated than it already is for him. Chinese Puzzle is gorgeous. It is a great load of fun and a particularly easy watch. The screenplay is written as if it assumes that the people watching the film haven't seen The Spanish Apartment or Russian Dolls. The days in which they all lived in Barcelona and their past loves are mentioned, but nothing else really needs to be said as far as the story goes. 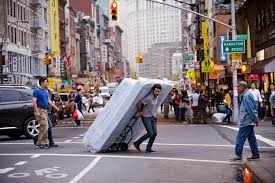 Chinese Puzzle works very well as a stand alone film. The script is very witty and often very funny. The inclusion of the German philosophers and Xavier's explanation of how people speak to foreigners, as well as one of the final scenes in his apartment are quite hilarious. Yet it is also quite touching without being overly emotional. The description given by Xavier on the train of how divorced fathers are often like warriors who refuse to let go of their children is really quite moving and beautiful. However, you do spend a great deal of the film trying to work out where it is going. It isn't a slow film, but it is not an overly eventful film either. Rather it just coasts along at a steady, but laid back pace which does work for the type of film which it is. There are several parts of the story (particularly involving Isabelle and her partner, Ju and also Xavier and Nancy) which are not really concluded as they should be at the end of the film and leave you hanging as to what actually ended up happening. Some things are concluded in perfect fashion, while some as practically swept under the mat. Like Cedric Klapisch's past films, the cities in which the film is set in are shown with love. There is a dedication to make New York look as beautiful as possible in ways which are different from the norm. The graffiti clad rooftop is filmed in such an interesting way and it looks far more attractive than you know it is supposed to be. Chinatown in New York City is not a place you see in many films, but it is welcomed as the way it is filmed heightens your senses and makes you feel like you know the place well. The way in which Isabelle and Xavier's situation is explained visually is enjoyable, as they are made to look like cut outs in a paper world. The soundtrack is also very fun and adds to the craziness and complexity of Xavier's life. Romain Duris knows his role well, you can tell that straight away from his performance, He knows how Xavier feels and projects this into his facial expressions. He does well and is extremely lovable. As much as he thinks he is complicated and messed up, he is just too likable to doubt his ability to work through what he is going through. Audrey Tautou is gorgeous. She has an unique style of comedic timing which has always worked for her and does again her. Her scene in the boardroom is particularly hilarious. Her and Duris have wonderful chemistry and she is a pleasure to watch every moment she is on screen. Kelly Reilly also does well. She gives a particularly emotional performance as a woman who is on the brim of happiness, but is still worn down from what she has been experiencing. Chinese Puzzle is charming and a wonderful feel good film. It has some very touching moments, but also some incredibly funny ones.